Make the birthday the greatest show on earth with these Circus party ideas for kids. Choose your favorite ideas to create your own special Circus party. 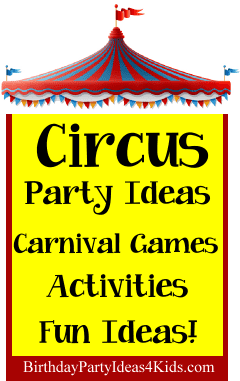 Fun Circus party ideas for Circus theme invitations, decorations, party games, activities, party food and much more. Create an admit one ticket with a circus font. Verse: Step right up and join the fun! Or … The Circus is in town for __________ 's birthday! Or … Come one, come all to the greatest show on earth! July 5, 2008 when we celebrate Marcy’s birth. Decorate the party room or outside area like a circus big top tent. Use a canopy or a large parachute to make the big top and then hang yellow and red streamers from the top to make it look festive. Use lots of helium balloons and streamers - red, yellow and blue. Yellow and red pennant flags on strings - or make them out of felt triangles. Have a parent or adult dress up like a ringmaster in a coat with tails and a large hat. If you will be playing circus/carnival type games make a ticket booth out of a large appliance box and paint it red and yellow. Give children tickets to play the different games and to exchange for food. tight rope. Have them balance while they are walking and let the ringmaster ask for large applause when they finish. bean bags out of brightly colored yellow and read fabric. One by one let the children toss the bean bags into the mouth of the lion. If you are giving away prizes let them win tickets to redeem at the prize table at the end of theparty. Gather two equal sets of crazy oversize clothes, big wigs, super size shoes, large sunglasses and red plastic noses. Divide the children into 2 teams and one at at time each team sends a person to run to the big pile of circus clown clothes, put everything on, run back and tag their teammates, then go back to where the clothes were and take them off again. Then they must return to the team so the next child can go. The winner is the team that completes the relay with every team member first. In a large play area create two zones at each end of the area as team safe spaces. Divide the space in half and place a marker in the middle (a tape line or orange cones). Both groups start at their end zones and decide on which character (Elephant, mouse or tiger) they will be. The whole team must be the same thing. Teams meet at the middle line. The team that wins chases losing team trying to tag them before the losing team makes it their safe zone. If any of the losing team members make it back to the safe zone without getting tagged then they are safe. If they are tagged then they must join the winning team. 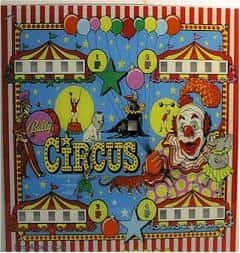 For more fun Circus games see our Carnival Games - a whole page full of Carnival games to add to your Circus birthday party! Let children decorate a little white sack with circus animal stickers and red and yellow markers. Use as a goody bag and to hold tickets and prizes. Decorate photo frames with circus themed animals and shapes. Decorate clown hats and then paint everyone’s face like a clown and have fun making everyone laugh. Great picture opportunity for the photo frames. Clown piñata filled with candy and circus treats. Serve yummy circus food for the birthday party - hotdogs wrapped in foil, popcorn in red/white bags, small bags of cotton candy (or rent a cotton candy machine), snow cones or nachos. Cupcakes with animal crackers in the center - make a cage out of pretzels or black icing. Circus train cake with Circus animals.